At the age of 81, Marc Aubin is still going strong, still training horses and still driving them with no intention of stopping. 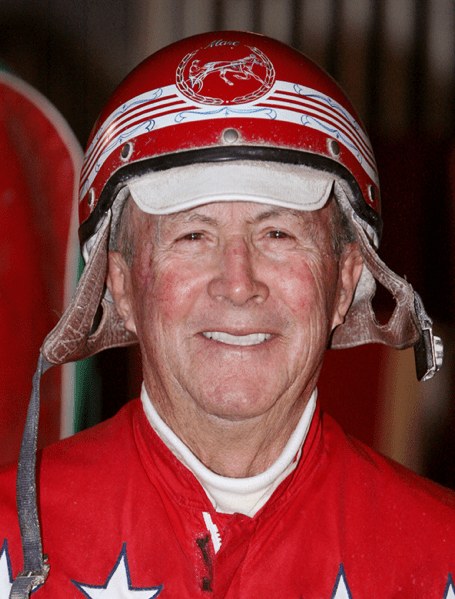 Aubin is believed to be the oldest active driver in North America, having just piloted a horse called No Bad Dreams to a third-place finish in a condition race April 4 at the Isle Casino Racing Pompano Park in Florida. He guided the four-year-old gelding by Dream Away to victory in the horse’s season-opening race, March 25 at Pompano, at 11-1 odds. The horse has won four of seven starts this year, including three tallies in the last four races, posting a speed mark of 1:50 3/5 last time out with Wally Hennessey handling the lines. The horse is keeping Aubin feeling spry and young. Born on July 31, 1933 in Quebec, Aubin is a great-grandfather who has 10 children, including two sets of twins, and 14 grandchildren. He has been married twice, the current one, Paula for 25 years. He met her when he was based in Chicago in the mid-80s. He subsequently moved back to California, where he drove for many years, then relocated to Florida in the early 90s. At one point in his career, he trained 35 horses. He’s now down to about nine, but they are the reason he gets up every morning, keen to get to work. “It’s because I want to do it,” he says. “What else am I going to do, start a new career? Let me tell you something: almost every night I dream about racing – a race or training a colt or something – and I wake up in the morning and wake up my wife and say, ‘Come on, let’s go.’ Going to work is my life. I don’t remember taking any holidays, no lengthy vacation.’ It’s my life. It’s a way of life. If I interrupt this, I don’t know what the hell is going to happen – and I don’t want to know. “My kids have been grown up for a long time. They’re married and on their own. They’re in Canada and I’m here and it’s very difficult to have a close relationship. They come to see me once in awhile and I enjoy when they come. We have gone over to see them a couple of times, but that’s about it. “I like it,” he says matter-of-factly when asked why he continues to drive. “Sometimes my horses are in a position where they can get hurt or abused a little bit and I don’t like it, and when I feel they need to be taken care of, I’m the guy that takes care of them. I go out there and I’ll drive them. When I get a horse that has qualified and I know he has a lot of ability, I like to drive them for their first races, just give them a good foundation before I send them on their way. “I’ve slowed down after getting hurt two or three times in a row. It seemed like I’d get back after being off for four of five months and I’d get into another accident. It was a series of events that more or less forced me to semi-retire from driving. Before I get on the bike I have concerns about getting hurt, but once I’m on the bike and on the track it’s like second nature. It’s like you’re at home. On Saturday morning, he qualified a horse at Pompano. His wife says she has tried to get him to stop driving several times because of the fear he might hurt himself. Aubin is listed as having driven 19,771 times in his career, winning 3,366 and posting earnings of almost $16 million. Since 2012, he has driven less than 10 times per year, and he last drove 100 times in a season back in 2007. From 1986-90, he annually drove 1,000 or more times per season. Twice during that span, he eclipsed the $1 million mark in earnings. He has a record of having trained 3,612 starters, winning 551 and earning more than $2.5 million. So far this season, he has 69 starters, winning 19 and posting more than $80,000 in earnings. He has a solid UDRS of .375. Since 2012, his UDRS of almost .365. Aubin has had an interesting life, one that had him riding in some amateur thoroughbred races in Quebec at age 14. He later became an officer in the Royal Canadian Air Force working in communications. He also worked in various other jobs, including private detective work, singing in night clubs, selling aluminum ware and as an agent for a steamship company – anything to feed his family. “I jumped around,” he says. His harness racing career started at age 25 when he and a friend were driving back from a fair on a rainy night and saw the lights of Connaught Park Raceway in Aylmer, Quebec. When racing was in a downward spiral in Quebec and his horses tested positive for an equine virus, he was forced to leave for the U.S. He began in Florida, working for Bruce Nickells, and then moved to California, becoming the leading driver by percentage at Los Alamitos four times between 1977-81. He was nicknamed Cowboy because he wore a cowboy hat and cowboy boots. “That’s the way I dressed, that’s who I was,” he says. He was training privately at the time with a barn of some 35 horses, and Aubin got behind each of them in the morning for training. “I had a second trainer, but he took care of the barn more than anything else,” Aubin says. Because of the uncertainty of harness racing in California, Aubin moved to Chicago, training and driving a top-end horse called La Valaise, who won about $120,000 in seven or so months that season in the Windy City. Overall, the horse won 21 of 68 starts and more than $200,000. Aubin drove once at the Meadowlands, called on by a friend to steer Maple Fritz, who won 37 of 223 starts and more than $460,000. “I never went on the Grand Circuit,” Aubin says. “For some reason I was happy where I was at and I wouldn’t move. I was invited to take my horses and race full-time at the Meadowlands in the peak of my career when it opened. “As a matter-of-fact, our horses were picked up by mistake one morning and I had to call the driver to turn around and come back. And I was invited to go to Yonkers when everyone went to the Meadowlands and I never went. I just stayed. I was doing well where I was at. I was just content. “If I’d have known what I know now, I would have gone,” he says with a laugh. His best horse has been Hearty Fellow, a pacer who banked more than $380,000 in a nine-year career, all of it at Pompano. Aubin trained the Hearty Welcome gelding for most of its 254 starts and drove in about half of them. The horse won the $50,000 Red Bow Tie Invitational at Pompano twice and was a close second another time. Hennessey was the driver in both wins – Hearty Fellow was the odds-on favorite each time – while Aubin was behind the horse in the second-place finish, won by the race favorite. Hearty Fellow had a speed mark of 1:51 3/5 as a nine-year-old. “When he started winning, they says ‘there’s a sheriff in town and it’s Hearty Fellow,'” Aubin proudly recalls. He is enjoying the success of No Bad Dreams, whom he says may be one of the best horses he’s ever trained. And he’ll drive the gelding and other horses as long as he feels he’s capable of giving them the best chance to win. Last night, No Bad Dreams took the feature at Pompano in a lifetime equalling best 1:50.3. The horse is owned by Jacalyn and Dan Boddie, Wally Hennessey was in the bike for the win, his fifth in seven starts this year, but Aubin won’t rule out returning as the horse’s driver. “As long as I can I will,” he says defiantly. “I’m still walking fine, standing straight and I’ve got all my faculties – at least most of them. People plan retirement, I don’t know what that is. I just enjoy what I do and will keep doing it as long as I can. I didn’t know I was the oldest one driving. I thought there was a 90-year-old somewhere. In 2013, Aubin was inducted into the Florida Harness Racing Hall of Fame, given to horsemen who have been outstanding leaders within the industry for more than ten years and who have contributed to the betterment of the standardbred industry. The following year, Hearty Fellow and Amante joined Aubin in the Hall of Fame. Vickie Desomer, whose husband Steve is nearing the age of 79 and still driving in California, knows Aubin from his time racing on the West Coast and is not surprised he is still active and occasionally piloting in pari-mutuel races. Aubin laughs when asked who would win if he and Desomer were racing against one another. “I think he’s got enough experience and I’ve got enough experience that whoever had the best horse would win,” he says with a laugh. More than 55 since he began in the sport, Aubin is proving that age is only relative. In a sport measured by time, he and his horses are still ticking.